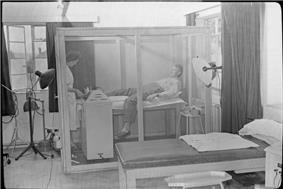 A British soldier in 1944 being treated with a diathermy machine. This machine produced radio waves, so to keep it from causing interference with other electronic equipment in the hospital the procedure is done inside a Faraday cage. A Faraday cage or Faraday shield is an enclosure formed by conductive material or by a mesh of such material, used to block electric fields. 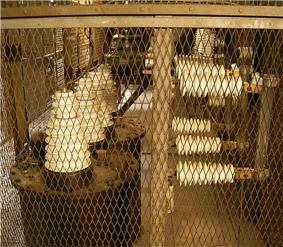 Faraday cages are named after the English scientist Michael Faraday, who invented them in 1836. 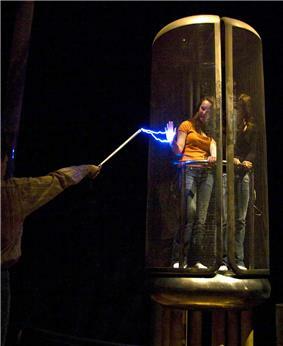 A Faraday cage operates because an external electrical field causes the electric charges within the cage's conducting material to be distributed such that they cancel the field's effect in the cage's interior. This phenomenon is used to protect sensitive electronic equipment from external radio frequency interference (RFI). Faraday cages are also used to enclose devices that produce RFI, such as radio transmitters, to prevent their radio waves from interfering with other nearby equipment. They are also used to protect people and equipment against actual electric currents such as lightning strikes and electrostatic discharges, since the enclosing cage conducts current around the outside of the enclosed space and none passes though the interior. Faraday cages cannot block static or slowly varying magnetic fields, such as the Earth's magnetic field (a compass will still work inside). To a large degree, though, they shield the interior from external electromagnetic radiation if the conductor is thick enough and any holes are significantly smaller than the wavelength of the radiation. For example, certain computer forensic test procedures of electronic systems that require an environment free of electromagnetic interference can be carried out within a screened room. These rooms are spaces that are completely enclosed by one or more layers of a fine metal mesh or perforated sheet metal. The metal layers are grounded to dissipate any electric currents generated from external or internal electromagnetic fields, and thus they block a large amount of the electromagnetic interference. See also electromagnetic shielding. The reception or transmission of radio waves, a form of electromagnetic radiation, to or from an antenna within a Faraday cage is heavily attenuated or blocked by the cage. A Faraday cage was used in 2013 by the Vatican to shield the Sistine Chapel from electronic eavesdropping during the secret papal conclave to elect the next pope. Elevators and other rooms with metallic conducting frames and walls simulate a Faraday cage effect, leading to a loss of signal and "dead zones" for users of cellular phones, radios, and other electronic devices that require external electromagnetic signals. During training firemen and other first responders are cautioned that their two-way radios will probably not work inside elevator cars and to make allowances for that. 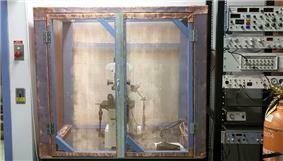 Small, physical Faraday cages are used by electronics engineers during equipment testing to simulate such an environment to make sure that the device gracefully handles these conditions. Austin Richards, a physicist in California, created a metal Faraday Suit in 1997 that protects him from Tesla Coil discharges. In 1998, he named the character in the suit Doctor MegaVolt and has performed all over the world and at Burning Man 9 different years. Some electrical linemen wear Faraday suits, which allow them to work on live, high voltage power lines without risk of electrocution. The suit prevents electric current from flowing through the body, and has no theoretical voltage limit. Linemen have successfully worked even the highest voltage (Kazakhstan's Ekibastuz–Kokshetau line 1150 kV) lines safely. Plastic bags that are impregnated with metal are used to enclose electronic toll collection devices during shipment to the customer, so that a toll charge is not registered if the delivery truck carrying the item passes through a toll booth. In Better Call Saul, Chuck McGill has transformed his house into a Faraday cage. In the TV series, Fringe, Season 4, Episode 6, "And Those We Left Behind" upon Peter's request, Walter builds a mobile Faraday cage which allows Peter to cross over an apparent time bubble without any side-effects. In the TV series, Person of Interest, Finch turns the Library into a Faraday Cage to isolate Root from The Machine. In the movie, Transcendence, Will Caster builds a Faraday Cage to provide a space for him and his wife to unplug from technology. In the movie, Enemy of the State, Brill takes Robert Dean into his Faraday Cage he built in a secure location to keep the NSA from tracking them. In the movie, The Darkest Hour, Sergei turns his apartment into a giant Faraday cage that hides the protagonists from the aliens. In the TV series Mr. Robot, Elliot meets White Rose, leader of the Dark Army, in a Faraday cage. In the TV series Doctor Who, Series 9, Episode 3 "Under the Lake", a Faraday cage in the underwater mining facility named "The Drum" is used by the crew, the Doctor, and Clara to take refuge from ghosts who cannot pass through the cage. It is later used as a trap to contain the same ghosts. ^ "Papal Election: Vatican Installs Anti-leak Security Devices at the Sistine Chapel". ^ Hamill, Sean (22 December 2008). "As Economy Dips, Arrests for Shoplifting Soar". ^ Bowman, Donna (March 30, 2015). , 'Pimento' ('They call it the caviar of the South. ')"Better Call Saul". AV Club. ^ Mahoney, John (September 4, 2007). "Hollywood Physics". Popular Science.